Curry has to be lip-smacking good. When I first tried bottle gourd though, I did not get that impression. The decision was instant to never try it again. Then something wonderful happened, and I had some exquisitely- made lauki aur chana dal. Well, not exquisite because it was too salty, but the potential with this vegetable was clear. I did not lose any time. I bought some bottle gourd and made some myself. Yum! Light, delectable, easy dish, I should say. I read some recipes online and checked with friends who have cooked them before and I knew what I had to do. The curry is so good, that if you are not careful, you will never get to eat it with rotis or rice because you would already have had it as soup. Mmm…! I am kind of enjoying the vegetarian dishes I am trying these days. Next in line is something to do with spinach and hopefully it will turn out well. Other than food, I am still waiting for spring, and in the mean time, I am tinkering with craft projects like making gunny bags, as you can see in the second picture. I have totally lost it! Over the weekend, I moseyed around some culinary stores like Crate and Barrel , and got an eyeful of designs, textures and possibilities for photography. How far I will succeed in transitioning this idea from my mind to my computer has yet to be seen. While I try and grasp my fingers around these trivial things, you make some curry and enjoy it with warm rice or hot rotis. 1. 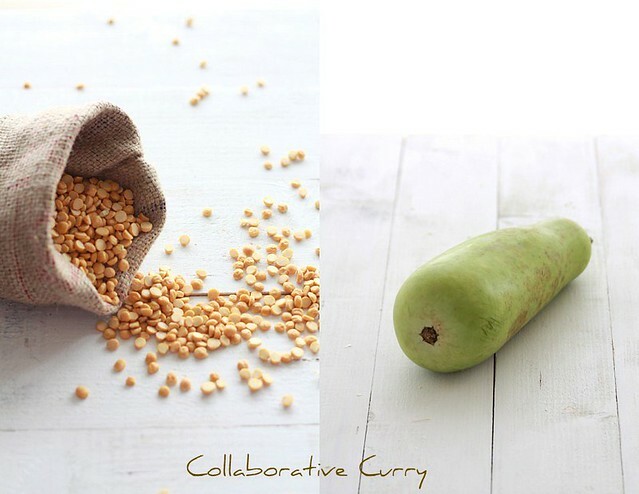 Clean and cook chopped bottle gourd and chana dal in a pressure cooker for 1 whistle. 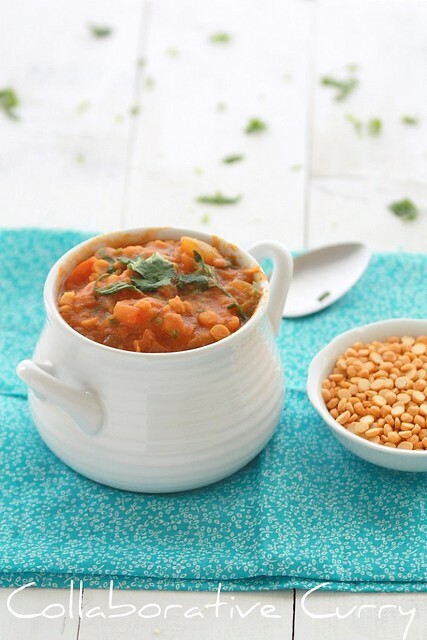 Pressure cookers differ, so make sure you cook the dal so that it retains it’s shape . 2. Heat oil in a pot which can hold all the curry. Start by adding asafetida and then splutter the cumin seeds. Follow these with onions and green chilies. 3. Once the onions are translucent, add turmeric, coriander powder and chili powder. Fry until you get the cooked aroma of the powder, about a minute of frying should do. 4. Add tomatoes and sauté. Once it’s cooked, about 2 or 3 minutes, add cooked dal and bottle gourd. If you like the texture of this curry to be thick gently mash part of the vegetables and leave the rest to retain its shape. 5. Add water depending on desired consistency. 7. Serve hot with rice or rotis. just reading all the ingredients makes me hungry for this! Love this dal very much.Your presentation is really nice..
Looks delicious curry..perfect with roti. Simply delicious, would love this curry with rice and papads,yummm! Simply delicious curry, definitely healthy ..tempting clicks!! Delicious and healthy dal..great with rice. i have nothing against this poor veggie and i am glad you have converted.The curry looks divine! I am drooling at the pictures. never really tried bottlegourd..have 2 get my hands on one the next time i head 2 a grocery store. I never liked lauki until my mom gave a big lecture on the health benefits. Now it has become a regular in my house. Never really tried this combo..lovely clicks..
One of the best lauki recipe to try... Beautiful pictures... YUM! I make lauki and channa daal too very frequently cos I love this combo...but mine is different from yours.....this looks yumm and spicy too! There is an UP/Bihar dish with the same ingredients; I think it uses ginger and garlic too. delicious recipe/....lovely combination dear ! Excellent preparation of lauki with chana dal. Love to have it with either rice or roti. 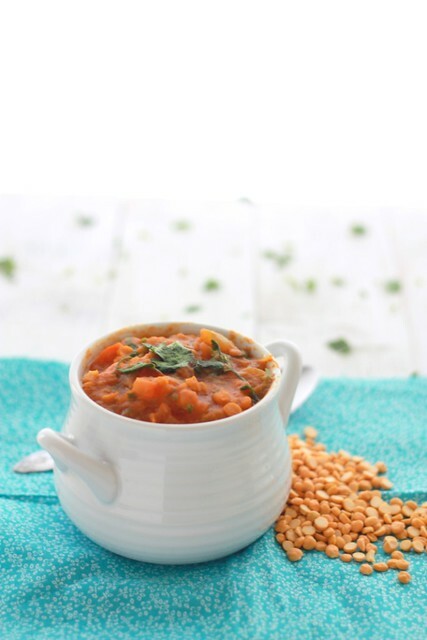 Adipoli dal curry. bottlegourd dalum nalla combo annu ennu thonnu. I love bottle gourd dal..Yours look amazing! That is an easy recipe. I have all the ingredients available. Purchased dal last week to prepare "daal tadka", so some would be left. How wonderful clicks, you made the simple curry look so gorgeous! I made the same bag chechi!!!!! love this combo..curry looks wow!!! We too make this! your version looks yummy! Lovely and yummmyyyyyy combo...perfect with theplas!! Lauki & chana Dal combo is one of my fav! Love it! We call "Koothu" this one, looks perfect! Love the craft sac! This looks so delicious! Love the color! Looks so delicious and inviting! Lovely.... tumbled into your blog for the first time...!! !